Fabulously fun and easy read. The first of the Miss Julia books, and my favorite. Charming Southern eccentrics breathe life into a predictable story of a proper Presbyterian wife ("Miss Julia") who finds her true self after the sudden death of her husband of 44 years, wealthy but parsimonious banker Wesley Lloyd Springer. 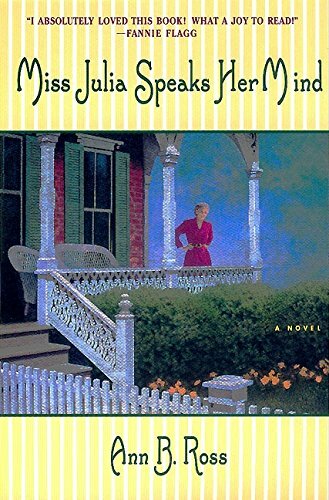 Julia is becoming accustomed to the role of rich widow when another shock intrudes: Hazel Marie Puckett appears on the front porch wearing "heels too high, a dress too short, and hair too yellow," with a nine-year-old boy in tow whose "eyes were so much like Wesley Lloyd's it was like looking at her husband before she ever met him." Hazel Marie is on her way to beauty school in Raleigh, N.C., since Wesley senior left no provision for her support, and Miss Julia realizes that she must take her husband's "last legacy" into her home. Once you get the book, send a PM to the next person on the list for their address. Journal when you receive and send it, and any other thoughts or such you'd like. Please write your username and city and state or country somewhere on the inside cover. Stamps, postcards, etc. are also great, but not required. I thoroughly enjoyed this book, and hope all of you do, too. Don't be shy with your opinions; Miss Julia wouldn't! Just received this from the postman today. I will read it as soon as I can and am looking forward to it. Can't say that I loved this book, but I liked it well enough. The story was interesting, but I just couldn't get past my desire to slap some sense into Miss Julia. Her character was phenomenally written, inspiring me at times to want to shriek at the top of my lungs, "WAKE UP!! Can't you SEE what is HAPPENING?" I may or may not read the sequels. I haven't decided yet. Released on Monday, November 10, 2003 at Post Office at 153rd and Garrett in Apple Valley, MN, postal release USA. Mailed off to the next person on the list. Picked this up from the Post Office today....after a bit of a delay.....Sorry!! Will begin reading tomorrow and get it back on it's travels soon!! Finished this book this afternoon, nice, easy read. I had a bit of trouble putting an exact age on Miss Julia, and that didn't quite sit right in my mind. The one thing that really gets me about this book is how Miss Julia talks about her church and how the church is supporting her....I'm wondering if this is prevalent all across the country or just in Miss Julia's world....I hope all who read after me enjoy this as I did! Thanks magicwritinggal for sharing! I'm pretty sure she's in her sixties. As a Methodist preacher's kid, I can tell you the level of Miss Julia's church involvement isn't too rare here in the South (though my father's nothing like her minister). I can't speak for the rest of the country, though. Glad you liked it. Rec'd in the mail the other day and will start reading after I finish reading the current book I am reading. Well, I was able to get to the book much sooner than I had thought and I really enjoyed it-I am looking forward to reading more of the Miss Julia Books soon. As soon as I get the next person's address, I will get it mailed on. The book is going on to Glade1 today. Received this book in the mail yesterday from reader1212. I'm looking forward to reading it--my daughter's name is Julia and she definitely knows how to speak her mind! I'll be interested to see how this Miss Julia deals with the world. I'll write more later. Loved this one! It has a lot of craziness and some twists I did not expect. I have been unable to get in touch with kymberlie so will send this along to tootshelling as soon as I get her address. We can add kymberlie back in later if she chooses. I'm having a hard time passing this one along! Kymberlie was unable to take it and so is tootshelling, so I have PM'ed shaunesay to see if she is ready for it. Will make another entry when I send it out. Mailed this book to shaunesay on 3-26-04. Just received! Will journal again when I'm finished and pass it on! thanks for the Ring Magicwritinggal! Just finished! A fast, entertaining and convoluted little story! I did like Miss Julia's wit. I've never lived in a small town where everyone knew everyone quite the way this was, and can't imagine how irritating it would be to have everyone know your business! The ending was a little odd, as a betrayed wife, I don't know that I could have let his mistress and child into my life the way Julia did, but sometimes you find happiness in strange places! Thanks for sharing this one magicwritinggal! I'll send on as soon as I get silverstone's address. Thanks! This little gem popped through the mailslot some days ago.... I read it right away and realized I had a new series to look forward too. I've recently read the Mitford series and yes I do like them better but this one is highly enjoyable too. It is so great to follow Miss Julias way from a dependent to an independent woman who lives as she chooses!! Good grief; a year later and this pops through my door! This actually arrived a few days ago but I've not been able to get internet access until today. I thought this was a *wonderful* book. Initially I didn’t like Miss Julia (can you believe that?! ), but I’ll tell you one thing, I loved her at the end! Yes, the book ended far too tidily, but yes, it was such a super story that I didn’t care. I’ve just read the other journal entries and was delighted to read that this is the first of a series. I’ll pass the book on as soon as I’ve got the address of kymberlie. Thank you so much magicwritinggal for ringing this.